ww2dbaseJohannes Hähle was born in Chemnitz, Germany in 1906. In 1932, he joined the Nazi Party. In Jan 1940, he was drafted into the military. As a member of Construction Battalion 146, he participated in the invasion of France. He was later transferred to Propaganda Company 637 on the Eastern Front to serve as a photographer, a profession he held prior to the war. In Sep 1941, he took several color photographs in Kiev, Ukraine, some of which relating to the Babi Yar massacre, but he kept these photographs a personal secret and never turned them over to his superiors. He was wounded in combat in the summer of 1942 and spent several weeks in a hospital. In Sep 1942, he was transferred to Propaganda Company 698, with which unit he served in North Africa, Belgium, and France. He was killed in La Bijude near Caen, France during the Allied Normandie invasion under unclear circumstances. In 1954, the Babi Yar photographs, along with others he kept privately, were sold by his widow to the journalist Hans Georg Schulz; in 2000, Schulz's widow sold them to the Hamburg Institute for Social Research. The photographs he had taken for the German military were confiscated by the US military immediately after the war; they were given to the German Federal Archives in Koblenz in 1962. 15 Feb 1906 Johannes Hähle was born in Chemnitz, Königreich Sachsen (Kingdom of Saxony), German Empire. 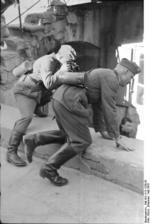 30 Sep 1941 Johannes Hähle turned in 108 photos with the title "insatz im Osten" to his superiors. 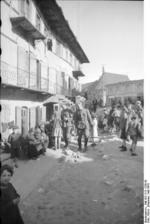 13 Oct 1941 Johannes Hähle turned in 7 photos with the title "Umfassungsschlacht ostw. Kiew" to his superiors. 10 Jun 1944 Johannes Hähle passed away in La Biljude, Calvados, Basse-Normandie, France.